Today SeaWorld Entertainment, Inc. released its third quarter earnings report and, as many suspected in the activist and business worlds, it was bad news for the marine theme park. Attendance was down 6 percent over the same period last year and adjusted revenue was down 18 percent. This was during the height of the summer season for theme park attractions. While some animal advocates may see this situation as a positive for the orcas, it has some significant negative aspects as well. As I have said repeatedly to those who will listen, I do not want SeaWorld to go out of business; I simply want it to change its business model. Going out of business will leave many animals – not just the 29 orcas that SeaWorld owns, but other whales and dolphins, seals and sea lions, sharks, sea turtles, birds, the list goes on – in the lurch. Who will pay for their care? Who will look after them? Even if some other corporation buys out SeaWorld, will it see captive marine wildlife in the parks' future? Or will it simply put these animals up for sale to the highest bidder, who could be anywhere, even as far away as China? The fact is, setting aside the welfare concerns for captive marine mammals and the backlash from the documentary Blackfish, a lot of kids these days find animal shows outdated and, let's just say it, boring. They want hi-tech animatronics, computer graphics and interactive displays, not to mention ever-more thrilling rides. They don't want to sit still in bleachers and watch trainers dance and whales jump. It's not cool. SeaWorld can still thrive as a true theme park; it can attract families and young people, with exhibits and rides that are interactive and based on innovative technologies without using live animals at all. It can phase out its animal shows and also bring in visitors from an entirely new demographic: animal activists! If a company buys out SeaWorld, it should consider the same possibilities. If a buyer just wants a theme park, then it shouldn't regard the animals as mere "assets" to be sold for a profit. It should work to retire the whales and dolphins to sanctuaries and to find good homes in the United States for all the other animals, because selling them to high bidders in China or another country would start them off on a really bad foot with the general public. Those of us who care about the welfare of captive marine mammals (and the captive marine mammals themselves) are living in parlous times. 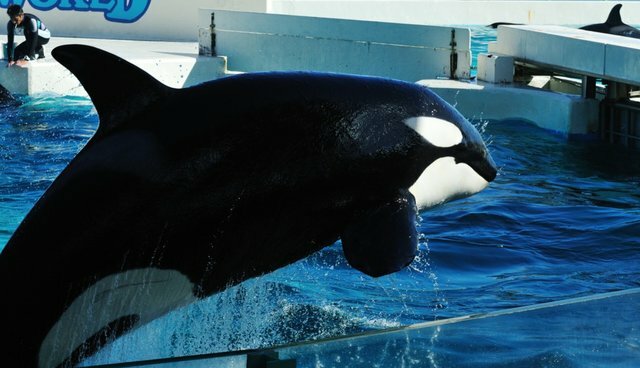 While in 10 to 15 years we may be exactly where we want to be - no more exploitation of captive orcas and the winding down of the display of other cetacean species - right now, during the transition from one state of affairs to another, change might come suddenly, and that's a situation these animals don't handle well. We must work to ensure that SeaWorld (or whichever entity takes over the beleaguered company) does right by the animals and doesn't just treat them like so much corporate inventory.